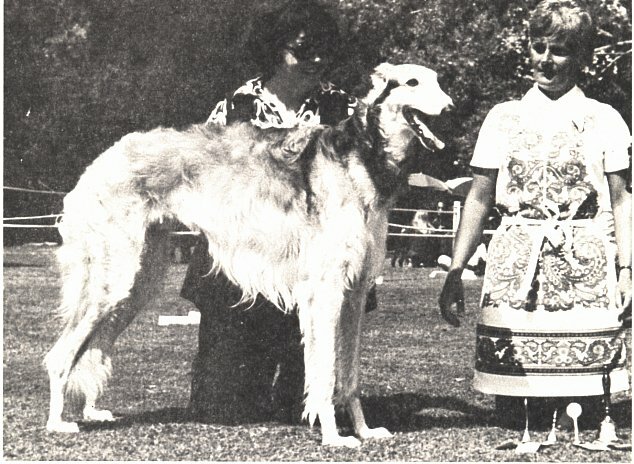 "Pasha" is the first Borzoi to complete his A.S.F.A. lure field trial Championship. He is also the first sighthound to attain the title of Field Champion in 1973. Pasha acquired all of his points in the first six weeks of 1973, in three consecutive trials. He placed first in the Breed Stake at both the BCOA trial and the MTBC (Mission Trail Borzoi Club) trial. His most recent win, was on February 11, at the Northern California Whippet Fanciers trial, where he finished third in the Open-Mixed Stake.